A Garlactic Harvest- Summer’s Officially Here! 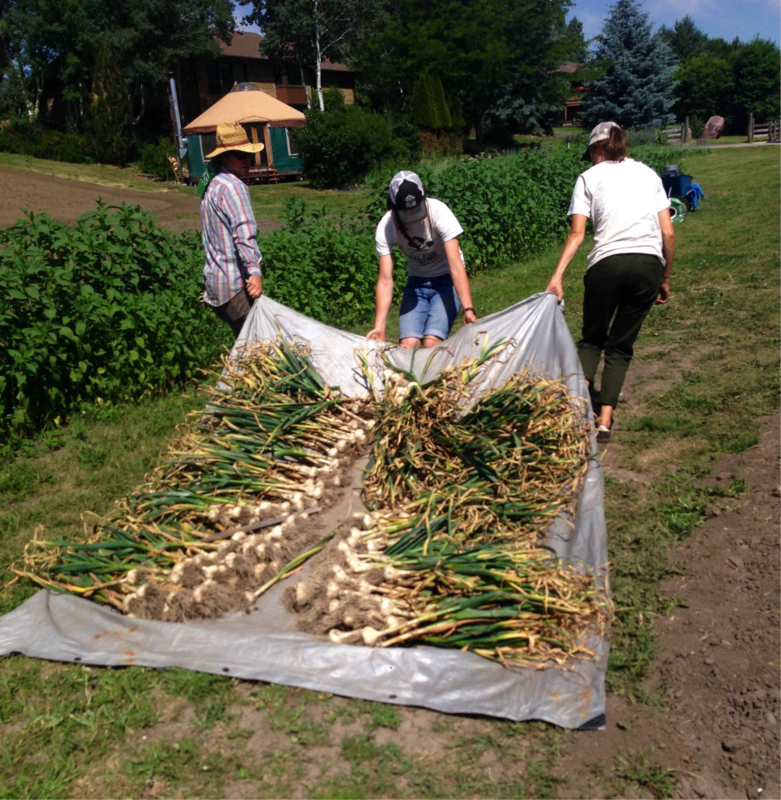 With the summer solstice a few weeks past, and near daily triple digit Fahrenheit-ed weather in full swing, I experienced another inauguration to the hot summer season: a garlic harvest extravaganza. 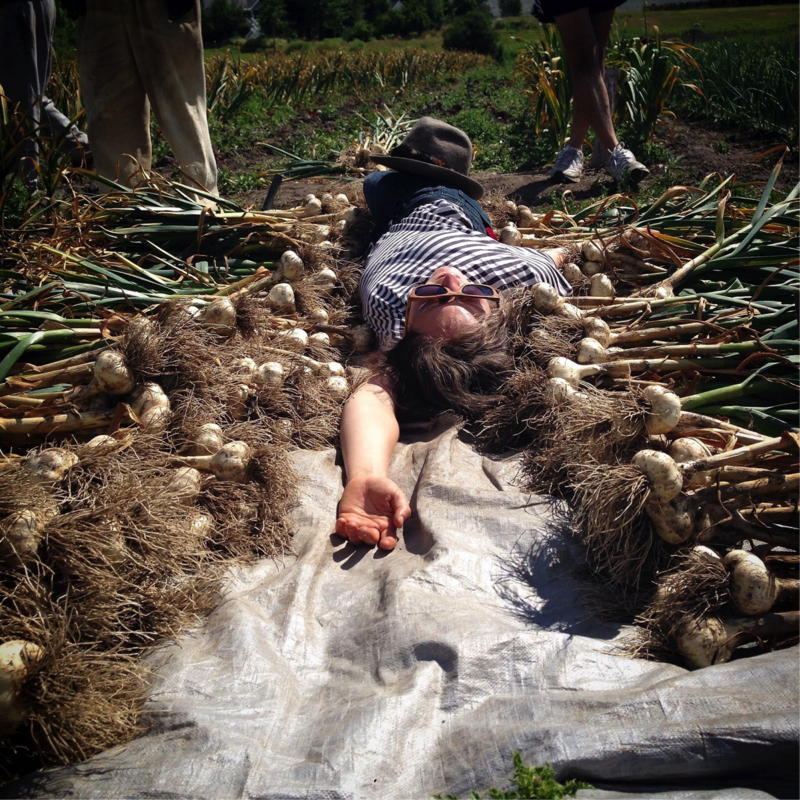 Compared to BBQs, or kicking back with a cold-one, it may not seem like the typical weekender party activity to yank out of the soil hundreds upon hundreds of vampire romance-repelling garlic. However, for Pete Rasmussen and Kati Greaney of Sandhill Farms, that’s what they have reveled in for the past few weeks, and how they spend much of their summers. To fulfill a near decade tradition, they invited us to get dirty and get gar-licked with them for a Farm Mob. 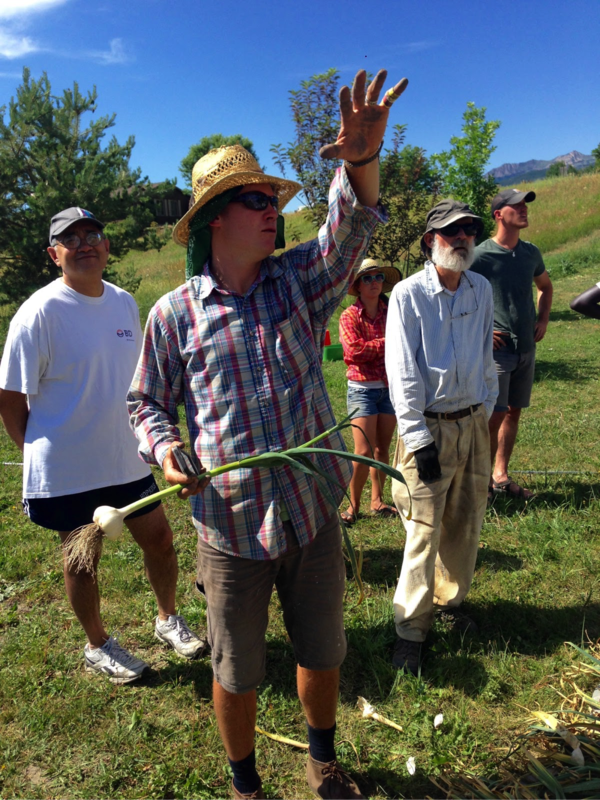 I joined a caravan of rabid gardening and local ag farming enthusiasts from the non-profits Wasatch Community Gardens (WCG), Slow Food Utah, and a team of young urban farmers with Real Food Rising for a 50-mile journey northward to the enchanted rural valley of Eden, Utah. Surrounded by the Wasatch Mountains and verdant lush greenery lies Pete and Kati’s farm nestled in a floodplain that is a major migratory summer hotspot for the Sandhill Cranes that the farm honors in name. 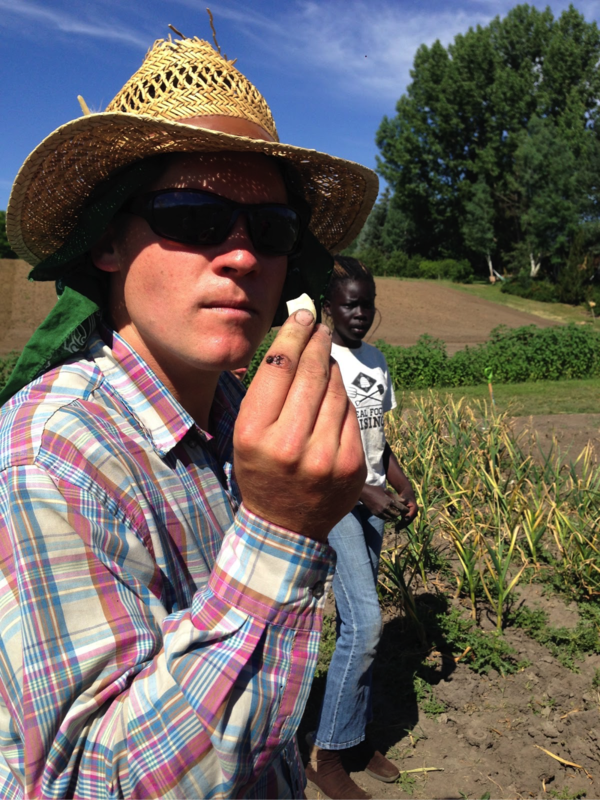 It is here that after graduating from UC Santa Cruz’s Agroecology program where he studied sustainable food growing and food justice, Pete put the theory of being a bonafide farmer to practice on land that he’s turned into a biodiverse food wonderland. 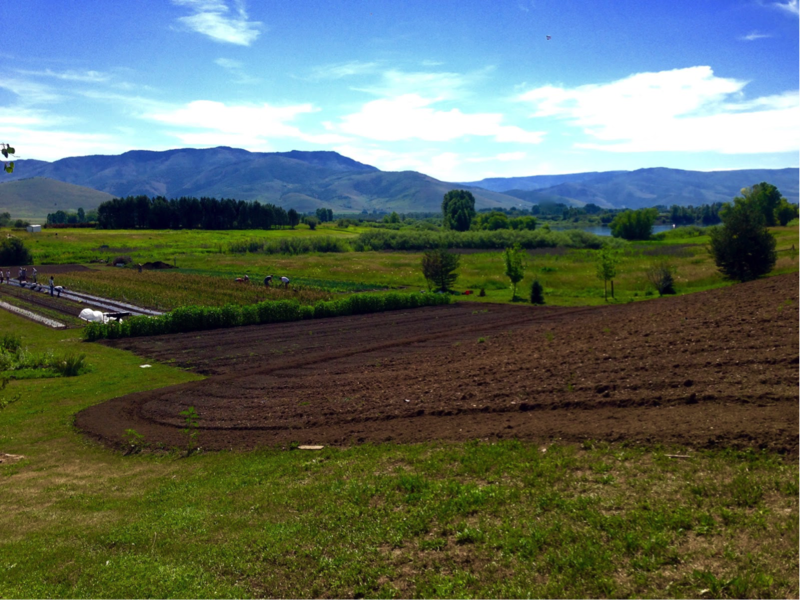 To replenish the soils every year, he relies on a combination of carefully researched organic soil management methods, rotating his crops of various vegetables and plating the sacred-three OVP cover crop mix of oats, vetch and peas. The result is insanely nutrient rich crumbly-cake soils and, 52 varieties of the, I kid you not, most gigantic monster sized garlic you may have ever seen. Left: Liz Pedersen, WCG School Gardening Coordinator wielding the most pungent glorious bouquet. Right: Doug from Slow Food Utah (I don’t remember his last name) with the prize. Stoically standing before us was an acre-big sea of emerald green garlic leaves with yellow dried end-tips fountaining out of the ground. 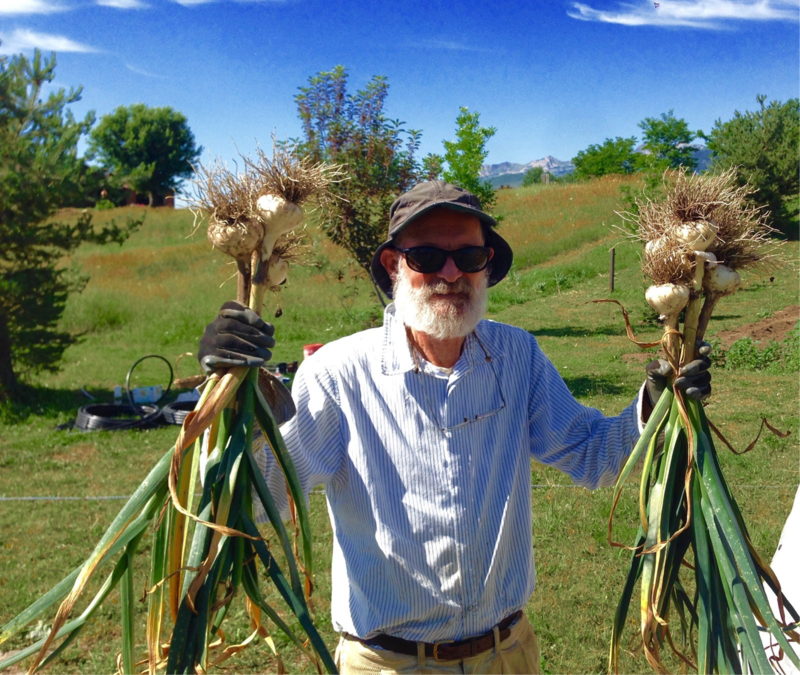 To start us off with the day, Pete grounded us with the garlic origin story that has its roots in the high desert montane regions of Central Asia. Touted for its medicinal values, ease of cultivation and long storability, this mountain herb was mightily celebrated over millennia and even used as a form of currency as it traded hands from all over the world. 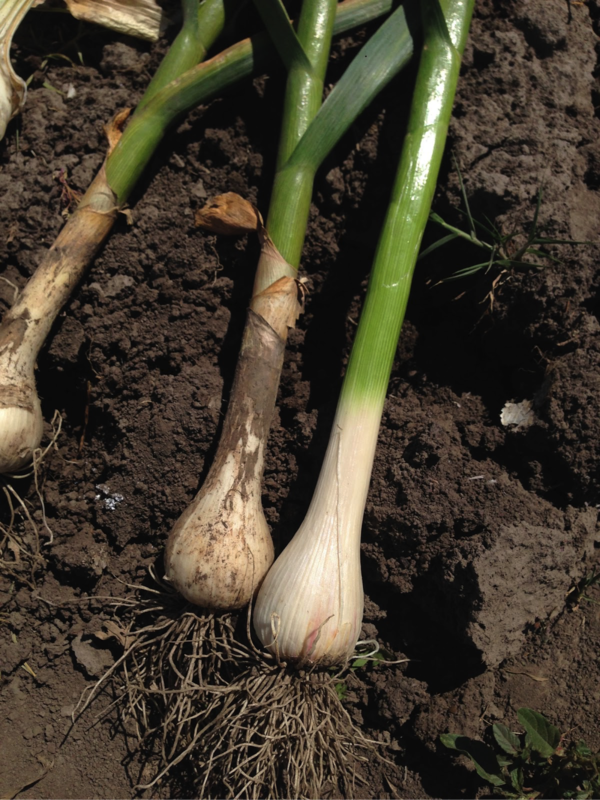 One clove planted in the fall and exposed to at least a 4-6 month of a cold wintry season will multiply into a cluster of 4-12 clones that make up the garlic heads sitting on our kitchen counter tops or emblazoned on Pete’s t-shirt. For me, the ultimate grounding came as we dared each other to a clove crunch-down to see who could bear the spiciness without wincing. I munched on a clove of Corona Music that first felt like a crisp juicy apple, but then, a few seconds later, a spice bomb instantaneously exploded in my mouth. “I don’t’ feel anythi..WOAH!YA!” I screamed. Next time, carry a bottle of honey to soothe the bite. Left: Farmer Pete taking a bite. 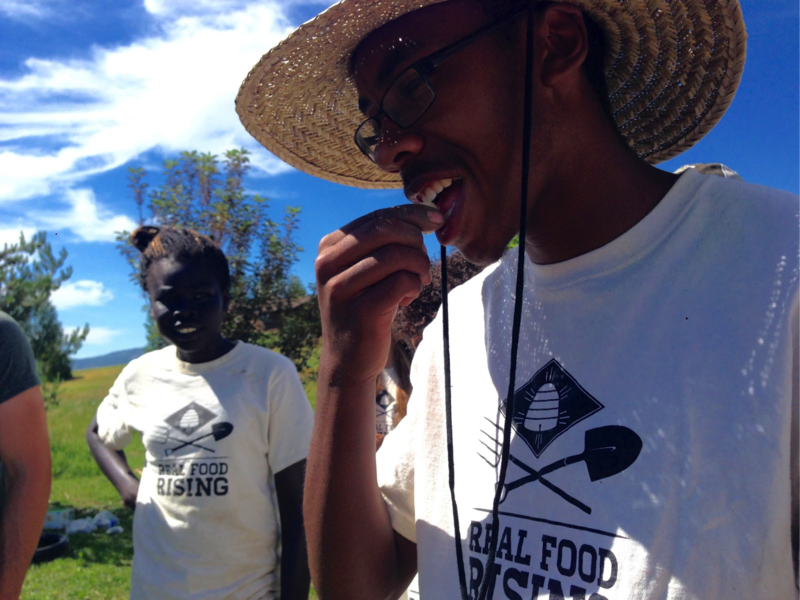 Right: A Real Food Rising Youth Farmer goes for the plunge. For an efficient harvesting operation, we organized ourselves into task teams. 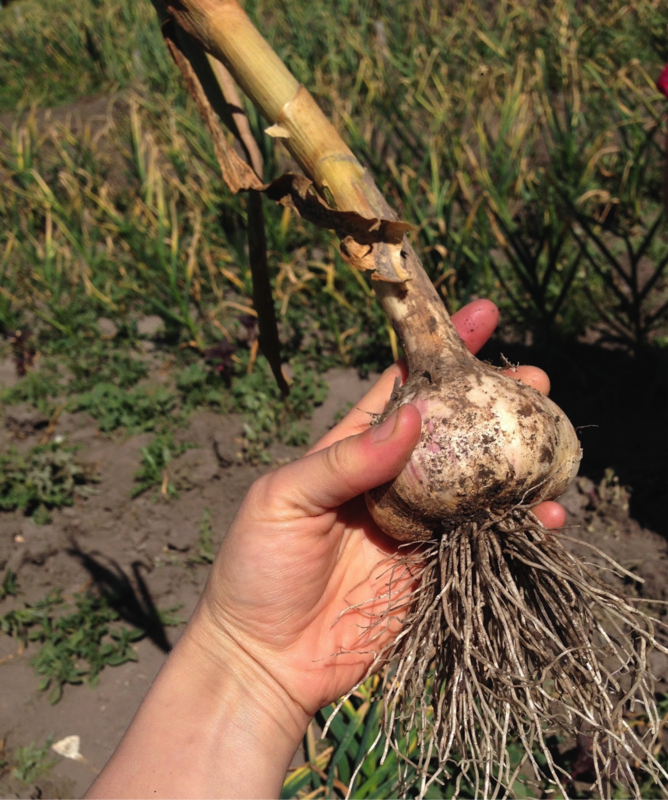 After a farm staff loosened the soil with a digging-fork, the Garlic-Pullers gripped the near 3-foot-long central stalks, gently tugged and unearthed massive soiled white bulbs with a mop of snaking roots dangling on the ends. 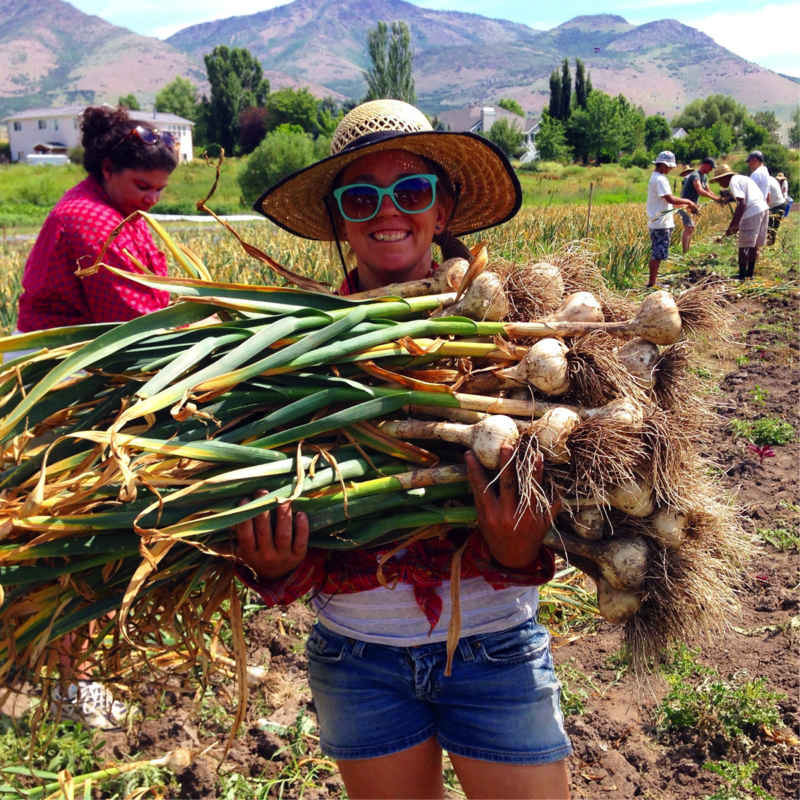 Center: Volunteer with from Slow Food Utah before a garlic field and with the hairy rooted harvest. Along with day-lighting the bulbs, this team also removed diseased or accidentally impaled bulbs by the soil-forking process. Meticulously culling out the diseased and Pete’s yearly practice of sending samples to organic farming research labs enables him to assess the health of his farm and ensure a solid genetic line of the over 50 varieties he grows for the local markets that value the integrity of each and their superior flavor. As the Pullers streamed down each row, the ‘Bottom Shakers’ followed behind them, scrubbing off dirt clods from the garlic ends, while the last team of ‘Garlic-Collectors’ gathered them into impressive bouquets and hauled them over to a tarp sheet splayed out at the end of each row. After clearing out a farm row, a group of four grabbed a tarp edge and dragged the mountain of garlic over to the garage converted into a garlic prep station. At the garage, we formed yet another assembly line with folks cutting twine, and others bundling up 10 or so stalked garlic for another group to tie up with twine. All the while, it was important that we kept the name of each variety intact and separate from each other, which included the whimsical and illustrious names of Inchelium, Corona Music, Siberian, Whale Shark, and Mom’s Ganesh. I helped the hanging-crew, and set the bundles on a two-tiered ladder of long wooden poles for the garlic to safely dry out and cure. This process helps prime the garlic so that it can be stored for several months, even up to a year without the risk of rot or, inversely, shriveling up too quickly. Center: Real Food Rising, Slow Food Utah, and Rosewood Garlic. As the afternoon heat kicked-in and stomach grumbled, we joyfully finished up hanging the garlic and took a break for the day, feasting on food many of us brought potluck-style and a tasty salad made with kale and arugula greens from raised garden beds near the farm-house…specifically designed for the farmer lunch series, no doubt. The ultimate treat, though, was scampering through a field of bunch grasses and cattails to the Pineview Reservoir where we took a dip for a supreme chill-down. Working at a farm of this scale that stresses nourishing the soil and values human-power made it crucially obvious the importance of having friends, neighbors and willing-hands to the farming cause, as together we fleshed out the idiom ‘many hands makes light work’ and time sweetly saved. 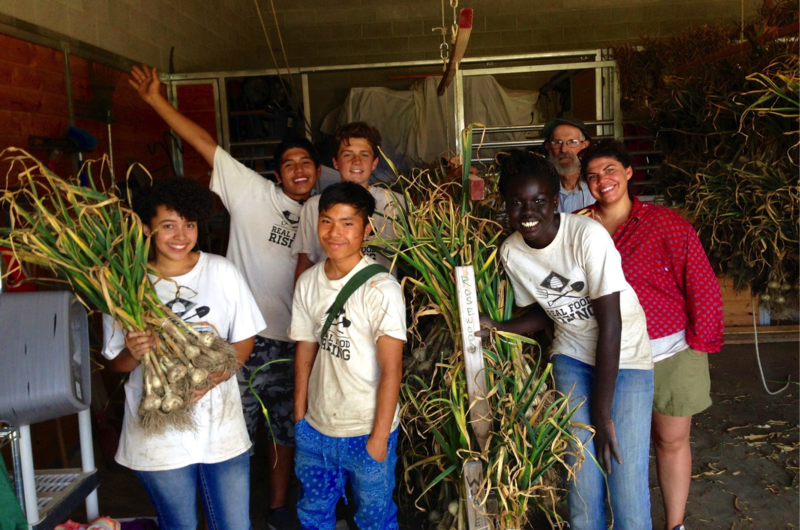 We rang in the summer in a way that made me more humble and in awe of garlic, farming and the pleasures of community. But you don’t need to have 5 acres or even 1 acre to celebrate a garlic harvest, or for that matter, growing food. A balcony garden to a community garden plot and engaging your network of friends makes tilling your soil, sowing your seeds, and harvesting your crops a worthwhile party where afterwards, you can always have a cold-one. 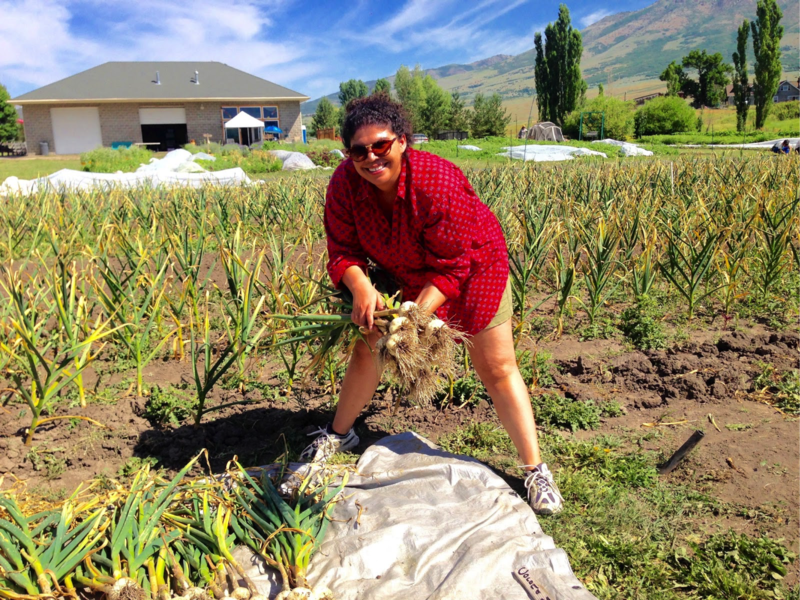 Blog commentary & photos by Alexandra Parvaz, a bonafide garlic sower and worshiper in Glendale Salt Lake City, Utah and interns as a photo-documentarian for Wasatch Community Gardens.